Admit it, barbeque is a fun way to cook. For many men, it’s their domain in the world of cooking. For other men, their work in the kitchen. Whether intentionally, or by default. Aprons are an often necessary part of cooking. So men who are involved in cooking in anyway can certainly use an apron. Not a frilly, girly apron, but a manly barbeque apron. Even better would be a funny barbeque apron. Or at least one that proclaims the manliness of the apron. Those men who enjoy being the daddy are also ones who end up in the kitchen with their little ones. Sometimes, it’s a choice to be more a part of their children’s growing up years. Sometimes, it as house-husband. But, either way, the kids are a huge priority in their lives. That often means messy times. Most often in the kitchen, but those messy times can cross over to crafty events. Finger painting is my favorite example. And then men need a protective apron. Aprons with pockets, essential. 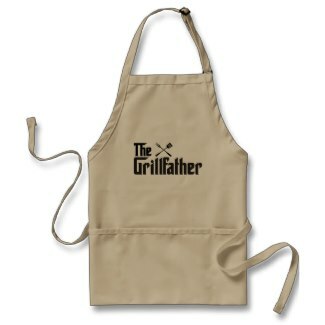 Whether a barbeque apron for men or not, big pockets are always in need. Pockets can hold all sorts of those needed items. Yes, the cell phone is one of them. But, there’s also things like the kids little toys that end up all over the place. There’s often the need to have a towel handy, too. Apron pockets are so much easier to deal with. Nobody wants to stick messy stuff in their jeans or pants pockets. So stick them in the apron pocket instead. When the apron gets washed, the pockets are cleaned, too. Simple, huh? We all know the value of keeping kitchen things handy. And aprons can help with that as well. Those fun barbeque aprons for men can hold plenty of cooking utensils and extras and keep them handy. We all end up in the kitchen, whether we like it or not. But somehow, food is essential. Both for ourselves and our kids. So enjoy a little humor, a little clothing protection and a little handiness with barbeque aprons for men. Enter your email address to follow Easy in the Kitchen and receive notifications of new posts by email.